Electronics Tip : Make a Simple Soldering Fume Disperser. I have been an electronics hobbyist since my early teens which was four decades ago and cannot imagine how many components I've soldered in that time. Soldering is great, but breathing soldering fumes is not as there's all sorts of unpleasant substances in there, not least lead vapour in 60/40 tin/lead solder and who-know-what in lead-free solder. Proper fume extraction to outside is the proper way to minimise health risks but is not cheap and not easily portable. For the hobbyist, a less effective method is to have a current of air blowing across the work area, diffusing the fumes away from the worker and into the wider atmosphere to reduce the concentration. Not perfect, but much better than nothing. 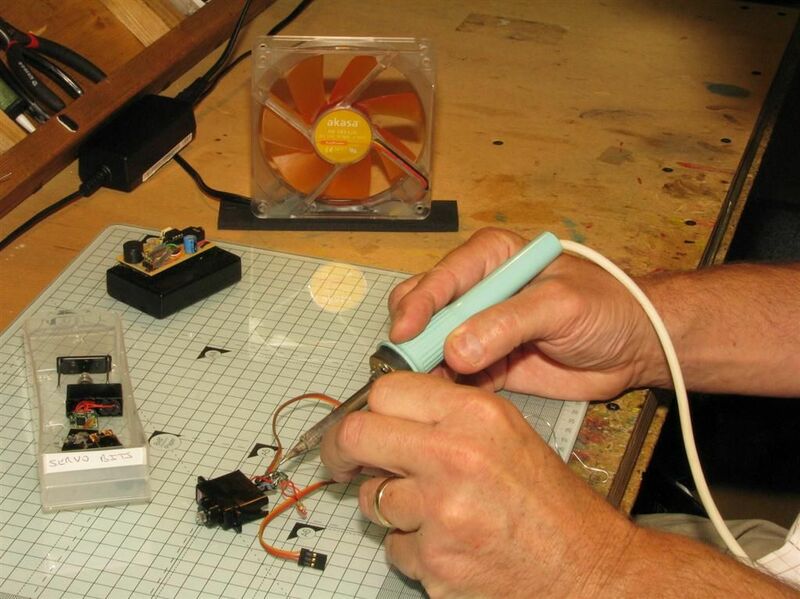 The simplest way of generating an air current is with a fan, and a slow moving wide volume of air is much better than a fast moving smaller narrow volume as it will cover a larger area, cause less cooling of the soldering iron and be quieter. The fan from an old full-size computer PSU is ideal for this. The only other items needed are 9V wall-wart type power supply and a strip of foam for the base. I've used a slice from an old mouse mat. Computer fans may come with 2, 3 or 4 wires, but usually there will be one red and one black which will be the 12V and 0V wires. They're the ones we're interested in. Any others are for speed monitoring and control. Everybody has a couple of spare wall-warts around and a 9V one is ideal for this as it runs the 12 volt fan at an adequate speed and will be quieter than running flat-out. The positive lead will nearly always go to the tip or centre contact of the connector. It will also be identified by either a white stripe or a ridge running along the wire. Putting the disperser together couldn't be easier - Just solder the positive lead to the red wire and the negative lead to the black. Use tape or heatshrink to insulate the joints and trim off any unneeded wires. Cut the foam large enough to provide a stable base. This will also reduce noise and vibration. Run the wires under the fan and glue the fan to the base with hot glue. You now have an efficient and portable fume disperser which will make soldering less of a health hazard. Mine runs almost silently and is effective over about a foot wide on my workbench. On hot days if you're not soldering you can use it as a personal cooling device too. A filter would only help with proper sucking extraction, and is superfluous if it's being vented to the outside air anyway. The idea of this device is to diffuse the fumes into the room atmosphere so you're only breathing them at one in 10,000,000,000 concentration rather than 1 in 1,000,000 as you would be if you were breathing them directly above the workpiece.